Autumn is a beautiful time of year as far as forests go, with that vibrant mix of greens, yellows, oranges, reds and browns. Add in some sunshine and a decent temperature, and you have all the ingredients for a lovely bike ride. This ride is called the Nieuwe Vuursche Route and it actually runs full circle, but I only did about two thirds. 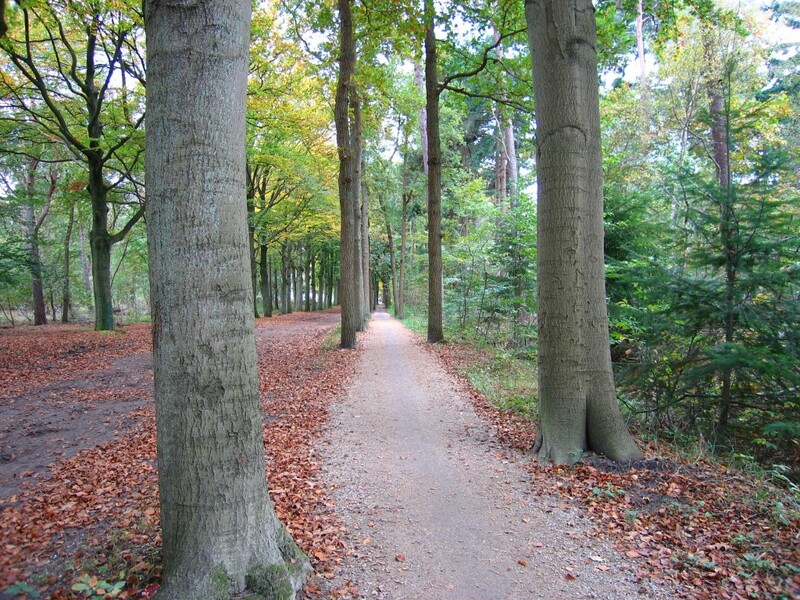 By the time I got to the town of Baarn, I felt like I’d done enough cycling for one day. Besides, the weather was deteriorating and it was getting quite late already, so I got onto the train and returned home. From Amersfoort’s train station, the route first went west to the village of Den Dolder, running mostly along another railway (not the one I travelled on) and straight through the first bit of forest. The next part followed a regional road for a few kilometres, and even though there was a separate bike trail, that wasn’t too much fun. The good parts returned when the route got off that road (in the lower left of the map) and turned north. 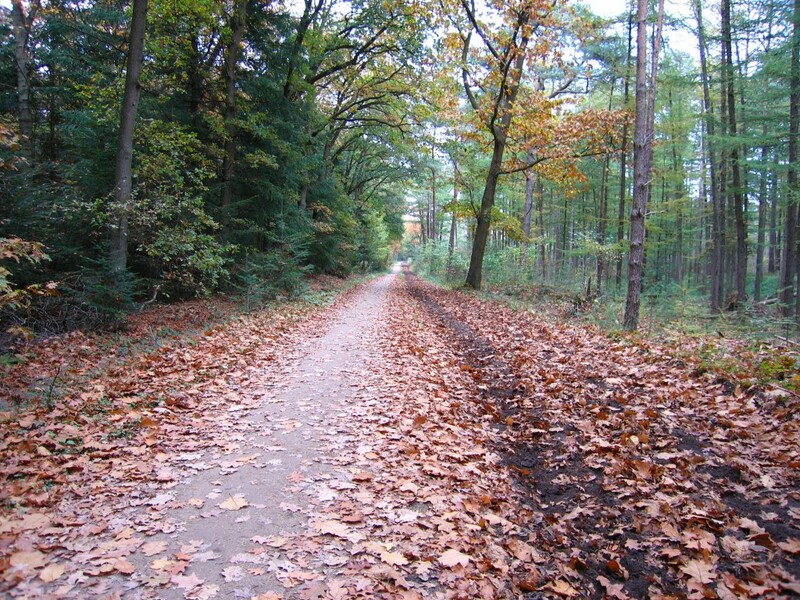 From there, it was all forests and hardly any cars in sight until the final one or two kilometres before Baarn. The route was pretty easy to follow. It’s an “official” one, so it’s signposted all the way. The tricky part is that the signs aren’t too large and some of them were really easy to overlook. That caused me to miss a turn northwest of Den Dolder, bringing me into the village of Maartensdijk. The sky had gone cloudy by then, so I didn’t have the sun to point out that I was going west instead of north. 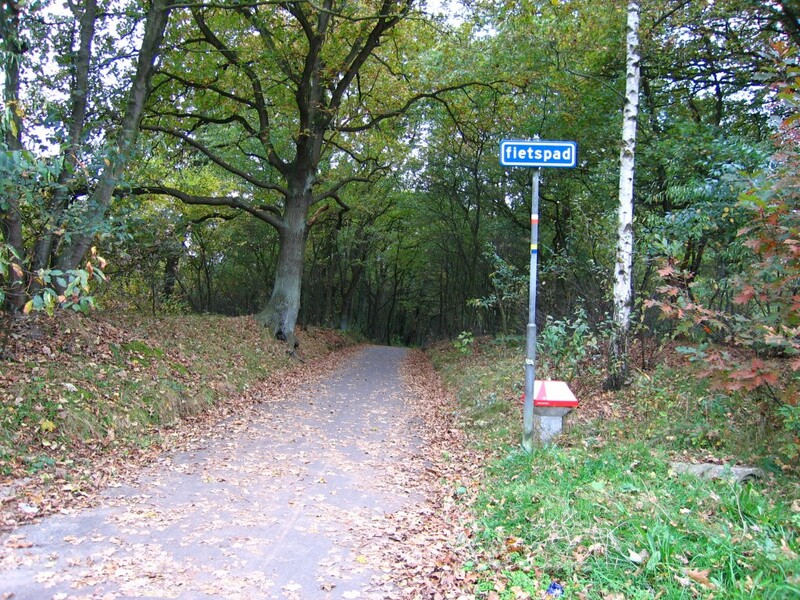 Exiting Amersfoort, the route followed a narrow bike trail on top of a small dyke. 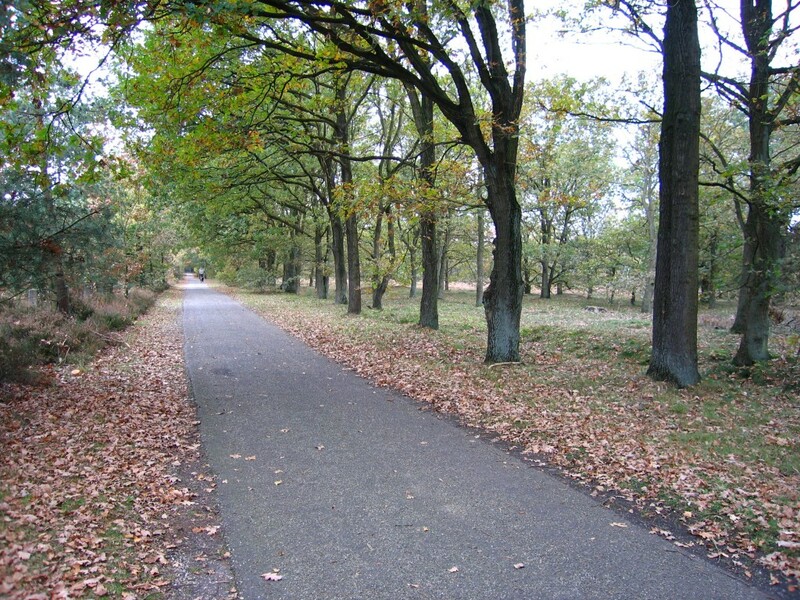 The trail ran parallel to the railroad between Amersfoort and Den Dolder (just invisible on the left). This is after Den Dolder, on one of the straight stretches north through the forest. The trail was barely wide enough to pass oncoming cyclists. The dirt to the left is a track for horses. The ride carried on north across narrow leave-strewn trails. Ruud – What a beautiful trail! I love reading about your bike rides. I have been disappointingly slack with my riding this year. My schedule has been a lot more difficult to maneuver around with the kids than I had hoped it would be … but, of course, that’s only a flimsy excuse. If I really want to do something, I’m able to find a way to work it into my schedule. Next year I’m hoping for more miles on my bike. I’m envious of all the different trail options that you have. I can only imagine how to begin to pronounce the names of all the different places! lol!! Tersie, I’m glad you enjoy my stories. You’ve been through a difficult year, but I think you’re doing a great job handling everything that you have to. From what I read on your blog, you’re slowly but surely getting around to doing the things you love. I’m sure you’ll be back on your bike next year to enjoy riding through the beauty that nature offers near your place.